SeaWorldSan Antonio will begin construction this spring on a significant addition that will open in 2016. This project will include a revolutionary new area for dolphins located in the northern part of the park. The changes will nearly double the size of the park’s dolphin pool and the habitat will allow guests to experience these amazing mammals in two new ways: underwater viewing and a dolphin swim experience. This project reflects SeaWorld’s ongoing commitment to improve its animal habitats while providing new ways for guests to make connections with the animals in its care. Large viewing panes will allow guests to see how dolphins swim, interact and play underwater--an entirely new vantage point. A new facility will allow guests to swim with dolphins in a naturalistic environment. The new addition, named Discovery Point, will be similar to Discovery Cove® park in Orlando, Florida by offering guests a dolphin swim experience in a lush, tropical setting. As of March 23, SeaWorld closed the northern part of the park to make way for the updates to its dolphin habitat. Access to Dolphin Cove® and the park’s Sharks/The Coral Reef attractions will be restricted until the project is completed in May 2016. When completed in May 2016, Discovery Point will become the hub for three of the park’s animal interaction programs. It will serve as a starting point for guests as they journey to Beluga Bay, Sea Lion Shallows and Dolphin Lagoon. These programs complement the park’s other interaction programs with stingrays and penguins, which will remain unchanged. 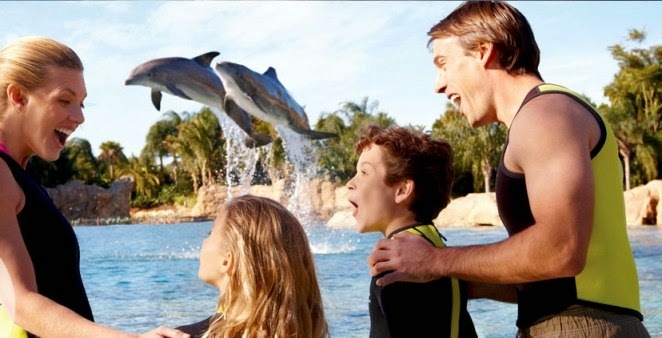 Watching dolphin perform is exciting and fascinating for the whole family. In the dolphin swim experience, guests will meet bottlenose dolphins during an interactive adventure and learn about dolphin behavior and communication, along with SeaWorld’s dolphin research and rescue efforts. After the classroom presentation and discussion on dolphins’ natural history and physiology, guests will wade into shallow water and become acquainted with one of the dolphins through close contact during this one-on-one dolphin encounter. Then guests can interact with their dolphin in deeper water for an exciting dorsal fin tow ride back to shore. “Guests have asked repeatedly for this once-in-a-lifetime opportunity to swim with these fascinating animals,” said Dan Decker, park president of SeaWorld & Aquatica San Antonio. “Up until now, we’ve only offered this experience in Orlando so this will make it much more accessible to guests in our region.” Paid reservations must be made for this program, and participants must be at least 6 years old to swim with dolphins. Children ages 6 to 12 must be accompanied by a paying adult who also is participating in the dolphin swim experience. “As an accredited Association of Zoos and Aquariums (AZA) facility and world leader in animal care, these future attractions will not only revolutionize the way our guests connect with and learn about our animals, but it will allow us to continue SeaWorld’s excellent standard of care,” Decker added.